What Are Umeboshi or Umezuke, or Pickled Ume? Umeboshi, or umezuke, are salty ume (Japanese apricots or plums) pickles which are traditional preserved food. 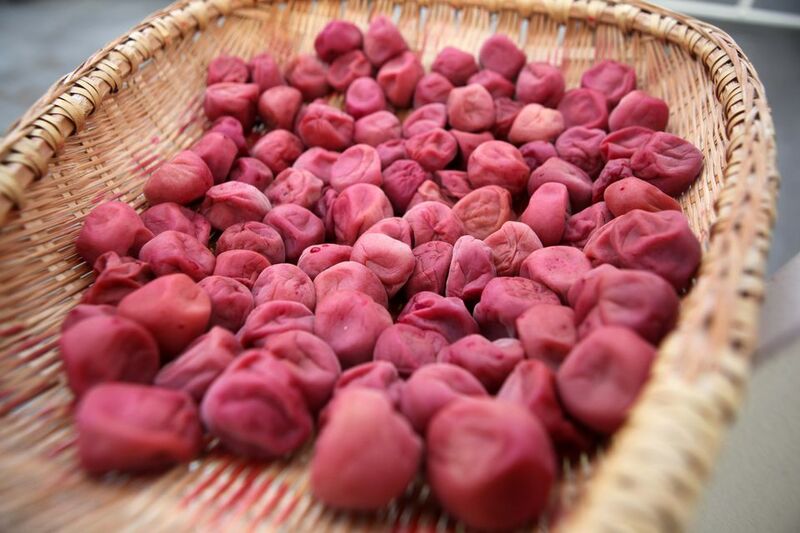 Umeboshi literally means dried ume, and pickled ume are traditionally dried under the sun. Umezuke indicates pickled ume which aren't dried. Although there are various flavors and saltiness of pickled ume available nowadays, they are traditionally pickled in salt. Umeboshi making in Japan typically begins in June when ume are harvested, and drying is done in July or August when the rainy season is over. Ingredients and making processes vary between households. To make 50-60 pieces (4 1/2 lb ripe ume), 10 1/2 - 14 oz. coarse salt and about 1/3 cup shochu (a clear distilled spirit which contains 35% alcohol) are basically used. The amount of salt can vary based on your preferences, but it is traditionally 15-20 percent of ume's weight. Although it turns salty, it has been said that the ratio is ideal to reduce the risk of mold growth. Optional ingredients for dyeing pickled ume are 1/2 - 1 lb akajiso (red shiso perilla leaves) and 1 - 2 oz coarse salt. It's a basic way of making pickled ume. Preparation: Remove the tiny black stems from ume, using a bamboo stick and wash ume. Soak them in water for a few hours. Drain them in a strainer and dry well. Wash and sterilize a ceramic or plastic container and set aside. Pickling: Place ume in a large bowl and spray or pour shochu over them. Sprinkle half the amount of salt over and shake the bowl to cover plums with salt. Place salted ume in the sterilized container. Put the rest of the salt on top of ume. Put a sterilized wooden lid or a sterilized plate on top of the ume. Place a sterilized weight on the top. Cover the container with thin paper and tie a string around the container. Leave it in a cool, dark place. After a few days or so, a clear liquid called umezu (ume vinegar) is extracted from ume. Let them pickle in umezu until dyeing or drying time comes, being careful about mold growth. Dyeing (optional): If you are dyeing ume with akajiso, wash the leaves well and drain in a strainer. To remove the bitterness from shiso leaves, sprinkle coarse salt over and rub them so that dark purple liquid is extracted. Firmly squeeze liquid out of shiso leaves and discard the liquid. Pour out clear umezu in the pickling container into another bowl. Put squeezed shiso leaves back in umezu and rub the leaves so that the umezu turns red. Separate the red umezu and shiso leaves into two bowls. Pour red umezu over pickled ume in the pickling container. Spread red shiso leaves on top of ume. Put a sterilized plate on ume and place a sterilized weight on the top. Cover with lid and leave the container in a cool, dark place until drying time comes, being careful about mold growth. Drying: When hot sunny weather continues at least three days, it's good to begin drying pickled ume. Take ume out of the container, reserving the liquid (umezu) in the container. Gently spread ume on bamboo mats or baskets and place them under the sun. It's common to dry them for three days, or until the surface of ume turns whitish. Please avoid rain during the process. Umezu left in the pickling container is also exposed to the sun for a day. Place umeboshi back in umezu and store in a cool, dark place. They can be eaten after 10 days or so, but it's good to wait for a few months for better flavor. For making furikake (seasoning sprinkles), dry pickled red shiso leaves under the sun at the same time. When shiso leaves are dried, finely grind them in a grinding bowl or in a blender. Store the shiso furikake in a sealed container in a cool dry place. Sprinkle them over hot steamed rice to eat.